1. Favorite Book: Villa America by Liza Klausmann was a fantastic read. Fans of historical fiction will definitely not want to miss this book. I loved the gorgeous setting and the cast of characters in this novel. 2. Biggest Surprise: The One That Got Away by Leigh Himes - I love supporting local authors and was pleasantly surprised with this novel. It's so much fun to read a novel that takes place in your hometown! 3. Biggest Disappointment: I truly wasn't disappointed by any book in particular this month, but I was disappointed by the fact that I didn't go into the reading of The Wrath and the Dawn with a clean slate. I recently read another retelling of the classic story the novel was based on, so this definitely took away from my experience. 5. Favorite Part of September: We had a party for my son's baptism and it was so great to see family and friends. After a rough spring/summer for my family, it felt good to celebrate. Now onto October! Let's see how many pumpkin flavored things I can consume! What were some of your favorite books that you read this month? Let me know! I will have to check out Villa America sometime. I liked The Wrath and the Dawn but I don't know if I will read the sequel. 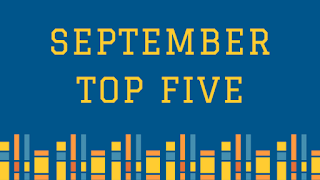 My favorite books of September are America's First Daughter by Stephanie Dray and Laura Kamoie, These is My Words by Nancy E. Turner and Small Great Things by Jodi Picoult. I am not sure I will read the sequel either, Christina! I'm so glad you liked America's First Daughter...loved that one! Time is definitely flying. I wish I had a pause button. I will have to check out those cheerios! :) Thanks for visiting and have a great weekend! Oh, being sick is never fun - not even if you are healthy and everyone ELSE is sick. I had that in September too; my parents and sister were all sick, but I haven't gotten anything yet *knock on wood*. I'm in a new job so I hope I'll be fine!! I'm hoping to get some spooky Halloween reads in this month. I love October. Plus, I'm celebrating Harry Potter all month. It's the worst, isn't it? Good luck with your new job! I am enjoying October so far! Can't wait to see the the changing leaves. Thanks for visiting, Lauren! Oh yikes. You must be exhausted! My son was throwing up the whole day yesterday and I felt so helpless because he couldn't keep anything down. Thankfully, he seems to be find today. I just hope he's over this bug. Have a great October, Christina! Being sick is genuinely the worst. I'm very paranoid about it this time of the year--last year, it was so bad. I was sick twice in just under two months for about two weeks at a time. I literally only had like one week in the end of October-the start of December where I wasn't sick, it was miserable. Hope your kids and dog are doing better <3 Enjoy October, lady!